Large format cameras (also called view cameras) are great because the negatives they make are large sheets of film, sized either 4″ x 5″ or 8″ x 10″ depending on the type of camera! These large negatives are best used for making very large prints that preserve the incredible details captured in the original image. 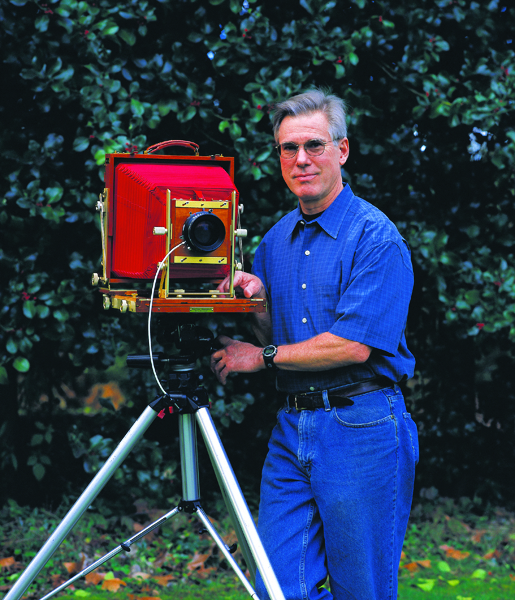 Steven Fey’s big cameras are: a 4″ x 5″ Toyo monorail camera sized and a Wisner field camera for his 8″ x 10″ film. Steven uses large format cameras because of the potential for more creative composition. Modern view cameras are fundamentally the same as cameras used 150 years ago. Instead of film, however, 19th century cameras used glass plates coated with an emulsion that captured the scene’s light. For more information regarding view cameras, we like LargeFormatPhotography.info. Steven uses a Hasselblad medium format camera when a lighter weight and increased flexibility or speed is necessary in the field. The final image you see is square. Hasselblad cameras have an image size of 2-1/4″ x 2-1/4″ and utilize the finest Zeiss lenses. The zone system was created by the pioneering photographers of the western landscape, Ansel Adams and Edward Weston. By using this technique in the field, photographers can better control the values (that is, lightness or darkness) in an image, so that light and dark areas can be represented correctly in the final print. This system produces the best negatives and transparencies for creative printmaking. Steven Fey is available for group and individual workshops on the zone system, large-format equipment, and custom color and black & white printmaking. Please contact the gallery for further information. To learn more about the zone system, visit this Wikipedia page.